At Harris Lowry Manton LLP, we are guided by the principle that everyone is equal under the law, and that all people should have access to justice. In order ensure that our civil justice system is fair, just and open to all who need it, we need to support it from the ground up – and that means ensuring that strong, competent and educated attorneys are there for the people who need them the most. 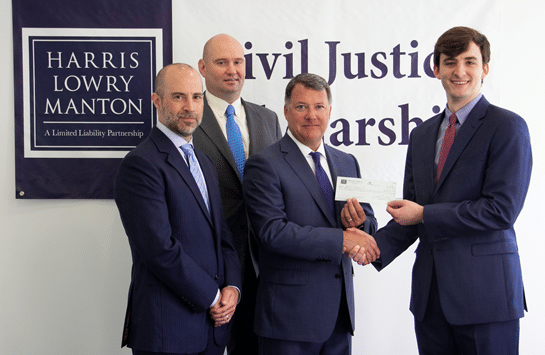 That is why we are pleased to announce the Annual Harris Lowry Manton LLP Civil Justice Scholarship. This award will be given to any incoming or current law student who is either currently enrolled, or who has accepted a place, in an accredited law school for the Fall semester of the upcoming academic year. This annual scholarship will be awarded at the end of July, and can be paid directly to the school upon the winner’s request. The award is non-transferable. Congratulations to John Hooven the HLM Scholarship Winner. Please email completed applications to scholarship@hlmlawfirm.com, or fill out the application form below. Any applications emailed or post-marked after June 30, 2019 will not be considered. No incomplete applications will be considered. Do not forget to upload your files below, if you choose to use the form. For questions about the scholarship, please contact scholarship@hlmlawfirm.com. Are you a current or incoming law school student?